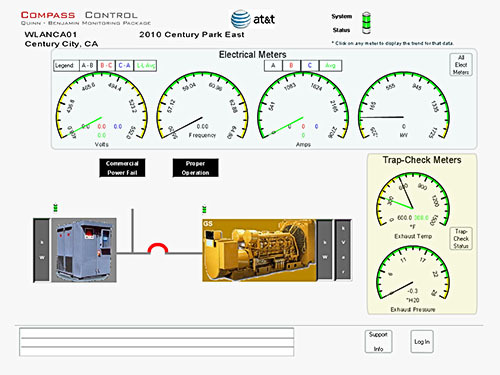 The generator monitoring features is just another adaptation of the flexibility of the Compass Control System. It has been developed in concert with our clients to provide a single integrated platform which combines the monitoring and control of standby power generation systems and their air quality initiatives so that the systems continuously operate in accordance with stated regulations. The system has been designed to provide extensive recording and reporting capabilities to demonstrate the designed effectiveness and consistent compliance thereof. The system interrogates the standby generator system and operates the attached supplemental load banks, in concert with the building loads, to operate the unit at air quality optimization while supporting the intended building loads.